This week is another one of those weeks where I don't particularly have any interest in the movies coming out (apart from the love of my life Midnight in Paris, which I'm going to add to my collection tomorrow), but I feel obliged to watch them all. I watched The Three Musketeers last night, which would have been followed by Fright Night (which has the guy I want to give cuddles, Anton Yelchin), if I hadn't accidentally picked up the 3D Blu-Ray thinking it could be played on my normal Blu-Ray. So thanks to my ignorance, I'll be watching it tonight, along with Monte Carlo (just to see if it is bad like I think). I might get around to watching Paranormal Activity 3 next week, since I can't be bothered going through a three movie night on a school night. It is exhausting. Tomorrow, I'll start my official Oscar predictions. Like last year, they'll be divided into specific groups for each day. That means that there won't be much else happening on the blog until at least Tuesday, as posting twice or three times a day generally doesn't work on this blog in terms of readership and stuffs. And for anyone who was around last year - yes, there will be prediction poetry! I literally just passed 150 followers. While that might not be the biggest achievement to most of you, it excites me quite a bit - but it scares me, because I think I'm going to let all 150 of you down somehow! Oh well, thank you 'Fulmer' who can be found on Twitter here, for being my 150th follower. The first plug is for a great fellow blogger Andy Buckle at Andy Buckle's Film Emporium. He recently changed his URL but had a bit of trouble doing that. You can now find his blog at http://thefilmemporium.blogspot.com so if he's missing from your blogroll or subscriber, make sure you are aware of the changes. I feel so sorry for him - and equally scared to change my really immature URL. But despite the problems, Andy is still rolling out some great stuff! There's a lot happening on the LAMB at the moment, with the LIONS (like the Oscars, just voted by us movie bloggers who know where it is at) being added to that list. Check out the winners each day! Speaking of the LAMB, I recently returned to the LAMBcast (which will be up sometime next week), and the lovely Jessica from The Velvet Cafe decided to chat about War Horse on there. She thought she'd get a lot of crap for liking it - but then I came along! Getting into the spirit of 'best of' 2011 lists in Nikhat, who I swear has seen everything. Her list of the best scenes of 2011 is great! Tyler, the master of epic lists, unveils his 50 Essential Arthouse Movies. He'll be proud of me - in class we had to write about genres of films and I wrote about arthouse, drawing a lot of inspiration from this list! Scott @ Front Room Cinema asks the question to watch or not to rewatch? I ask this question quite often! One movie I'm actually quite looking forward to seeing is The Deep Blue Sea, starring Rachel Weisz and Tom Hiddleston. Aziza gives a nice review of it! A great site I just discovered is Letterboxd, which CS @ Big Thoughts from a Small Mind thoroughly recommends as well. And guess what - it was designed in NZ! On a scale of 1-10, how excited are you for the Oscars this year? Oscars this year? Maybe a 7. The coverage here literally starts at the exact same time as my first lecture of the year, in a course I can't really afford to miss :( Then I'm at uni the rest of the day. I'll try to follow on twitter as best I can! The coverage starts when I have Biology, and then I can go home and catch the last half providing I can find a good online stream. Last year I was so lucky because I had my computer class when the Oscars started, so I could keep up with the winners. This year I'll just be checking my phone like mad, hoping not to get caught! A 5. I only want some big wins for The Tree of Life and run around the house screaming Chivo's name when he wins the Cinematography prize. I did that when Trent & Atticus won for the score for The Social Network holding a NIN shirt in tow! Haha, the online one I know who is going to win that I'll get mega excited about is The Tree of Life winning best cinematography. If Jessica Chastain won her award (unlikely), I will probably have a heart attack! Wow, a post of mine inspired an essay/writing piece? I feel incredibly flattered! Would like to read it too, if you choose to share it. Thanks again for the linkage, and I will bid your posts adieu for as long as you are blogging about the Oscars - don't take it personal, I just don't really read any Oscar-related posts from anyone, but I might give them a look over because I'm sure you'll do some great work with them. 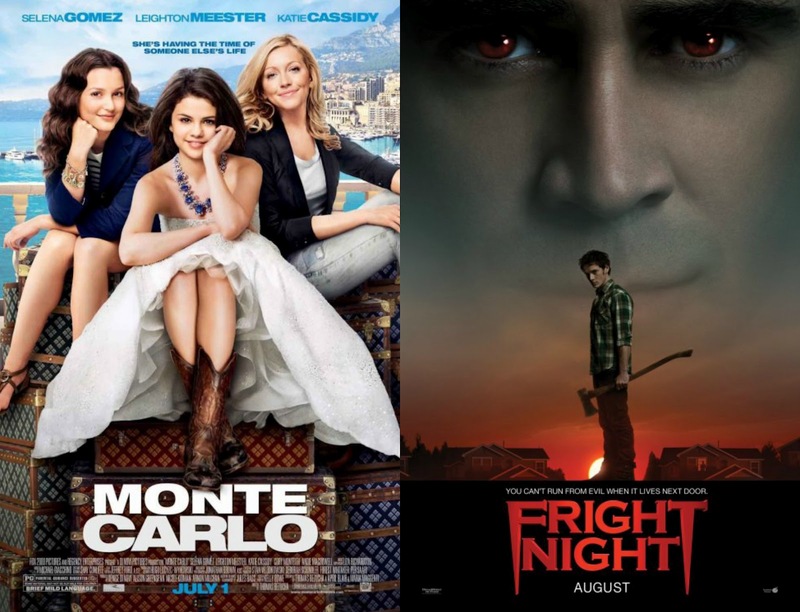 Also, I feel sorry for you only having MONTE CARLO and FRIGHT NIGHT to watch. Don't Fatso send you anything even remotely more interesting than those two? :P Just kidding. Anyway, have heaps of fun watching MONTE CARLO. So jealous that I didn't have time to grab a copy. Ha, it's not an essay. It was a venn diagram, comparing arthouse, romance and action films. You wouldn't wanna see it...it is so messy! I'm only watching Monte Carlo and Fright Night since I like to watch everything that comes out on DVD and since I get DVDs for free, I can afford to do that. And my Fatso month starts tomorrow...so I'll be getting some quality there! 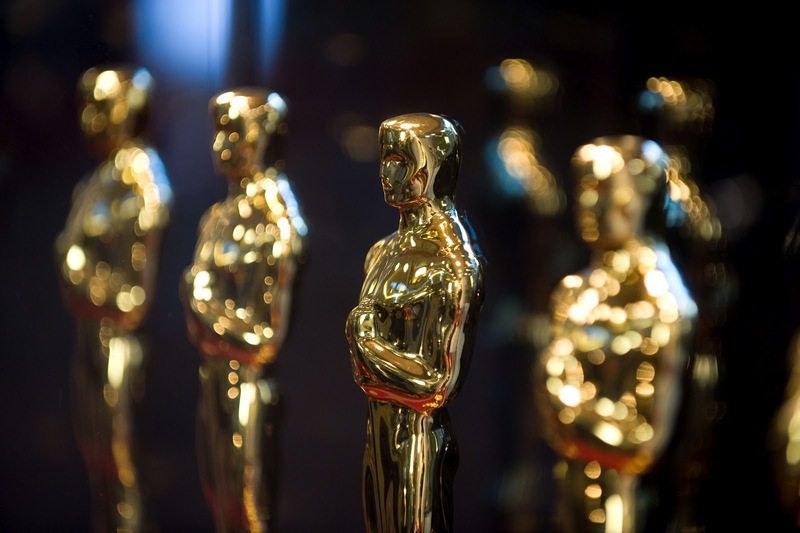 See the thing about Oscars is that even though it is barely full of any surprises, I still get up at 2:30 a.m. because the timings always confuse me, even though I know the actual ceremony will begin at 5:30 a.m. This year has its good point in the form of a hopefully good Billy Crystal and The Artist team, but also the fact that almost certainly no one from the Harry Potter main team would be there is making me very very angry. I'll say 6, though it will inevitably become a 20 right before. You've seen WAY more than me! Ha, I'm so slack. I know exactly what you mean. On Sunday night I'll be hyperventilating from excitement, then all through school I'll be on edge like I'm on drugs or something. It happens all of the time! Hopefully I can catch the second half of it. Oh gosh! I'm glad I have my exams at the end of the year and not the start. And I *still* feel sad about The Social Network's many snubs, after all this time. Aw another link? I am starting to blush!! I am surprised the 3D blu-ray didnt work, normally they have a standard 2D file on there as well. I am pretty excited to see the Oscars, but if The Artist wins 80% of the awards I'll be pissed. I just need some surprises there and there! Have a nice day...or evening! I haven't seen The Artist so I can't judge, but I like surprises! Haha, I wonder if Jean will sleep on some people? I saw Fright Night a couple weeks ago. Let's just say I was largely unimpressed lol. Congrats on 150+! You and me both. I had high hopes for it (not sure why), but I didn't like it very much at all. And thank you! I'm at a 2 or 3. I'll still probably watch but I'm not very excited this year. Congrats on hitting 150 followers though! I'll probably watch the end of it too, but I was *way* more excited last year. Yay! Thank you for the link love! And I was really happy to find an alley in the show! As for Oscars, hmmm probably around 5? I probably will watch it just so I have something to blog about the next day, ahah. The Three Musketeers was really good to look at it, and I love Christoph, but it didn't do much for me. The slow motion was a bit too much. Haha, I'll be tapping away at my laptop as soon as the ceremony has finished, because I'm a nerd like that! Truthfully, i'm a 4 for The Oscars. I wasn't too hyped about it before, and my excitement went down severely after Extremely Loud got Best Picture over Drive. I'm not too fussed about as you don't need to be psychic to know The Artist will dominate this year. DRIVE :'( Why was this not nominated?